For other uses of Cayambe, see Cayambe. Cayambe or Volcán Cayambe is a volcano in Ecuador, in the Cordillera Central, a range of the Ecuadorian Andes. It is located in Pichincha Province, some 70 km (43 mi) northeast of Quito. It is the third-highest mountain in Ecuador, at an elevation of 5,790 m (18,996 ft) above sea level. 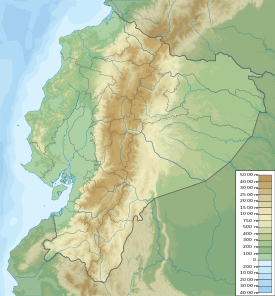 Cayambe, which has a permanent snow cap, is a Holocene compound volcano which last erupted in March 1786. At 4,690 metres (15,387 ft) on its south slope is the highest point in the world crossed by the Equator, and the only point on the Equator with snow cover. The volcano and most of its slopes are within the Cayambe Coca Ecological Reserve. Cayambe was first climbed by British adventurer Edward Whymper and his two Italian guides and companions Jean-Antoine Carrel and Louis Carrel in 1880, and it remains a favorite of mountaineers today. Cayambe's peak is the point of Earth's surface farthest from its axis; thus it rotates the fastest as Earth spins. ^ "Cayambe". Global Volcanism Program. Smithsonian Institution. ^ "Cayambe". Volcano World. Oregon State University. Retrieved 22 May 2018. ^ Klenke, Paul. "Distance to the Center of the Earth". Summit Post. Retrieved 4 July 2018. Wikimedia Commons has media related to Cayambe.